A 9-year-old, male German short-haired pointer is presented for rapid breathing, shortness of breath, and coughing. The dog has lived his entire life in a multidog household in the rural countryside of Tennessee. His vaccination, deworming, and heartworm preventive histories are good, though not perfect. There are no gastrointestinal signs, polyuria, polydipsia, or syncope. The other dogs have no evidence of illness and none have been boarded. The owners indicate that the dog may be slowing down but he has not exerted himself since last hunting season. Physical examination reveals a heart murmur with the point of maximum intensity (PMI) at the right fourth intercostal space. Generalized crackles are audible upon thoracic auscultation. There is no nasal or ocular discharge, ascites, or jugular venous distention. Heart rate is 132 beats/min, respiratory rate is 55 breaths/min and mildly labored, and body temperature is 103° F. Mucous membrane color, capillary refill time, and pulse quality are normal. The dog is slightly depressed and his body condition is adequate, albeit somewhat thin. Figure 1. This lateral radiograph was obtained from the 9-year-old, male German short-haired pointer described. The heartworm antigen test is positive but no microfilariae are seen on direct smear. The owner declines the following tests due to financial reasons: CBC, serum biochemical profile, urinalysis, NT-proBNP (cardiac biomarker), and full radiographic series. 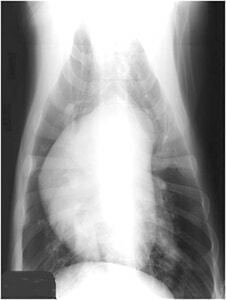 View the thoracic radiograph (Figure 1) and, after considering the clinical findings and history, create a list of differential diagnoses. 2. WHAT IMMEDIATE THERAPY SHOULD BE PERFORMED? If you answered the second question incorrectly (see What Immediate Therapy Did You Choose? ), you are not alone. See the responses compiled during Heartworm University (heartwormsociety.org/HWU) seminars in various U.S. locales (Table): less than 30% of attendees gave the correct answer. This suggests a knowledge gap in many veterinary practitioners regarding the pathogenesis of left- and right-sided heart failure as well as heartworm-associated pulmonary pathology. 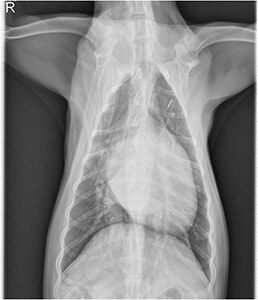 The dog, whose radiograph you see (Figure 1), is coughing and dyspneic, no ascites, microfilaremic and has a heart murmur. How would you treat him? Intravenous furosemide is life-saving in left-sided congestive heart failure with pulmonary edema. However, heartworm disease affects the right side of the heart, so cardiogenic pulmonary edema would not be the therapeutic target. Signs of right-sided heart failure include jugular distension, ascites, and occasionally, pleural effusion, as well as exercise intolerance and possibly syncope. Figure 1 does not demonstrate any substantive left heart enlargement or pulmonary venous distention: chronic vavular heart disease and dilated cardiomyopathy, the two most common causes of canine left heart failure, are almost always associated with substantial cardiac enlargement when pulmonary edema is present. The same is true for answer B. While pimobendan may have a role in the management of pulmonary hypertension and/or heart failure in heartworm disease, this patient most likely has an (inflammatory) infiltrate in the lung. It is highly unlikely that the pulmonary signs are a result of heart failure. In heartworm disease, pulmonary hypertension may be present along with a lung infiltrate and a right-sided systolic murmur. Tricuspid regurgitation would be supportive but not diagnostic of this differential. This regimen is merely a more aggressive way to approach management of left-sided heart failure. As mentioned in answer A, heartworm disease affects the right side of the heart. Remember that murmurs associated with chronic degenerative valve disease and cardiomyopathy are almost always associated with mitral regurgitation (heard loudest at the left, not right, cardiac apex). Digoxin is rarely used in the treatment of heart failure unless there is a supraventricular arrhythmia, such as atrial fibrillation. In this regimen, the furosemide would be aimed at removing pulmonary edema, which is not present in this patient. Neither of these drugs is indicated for this patient at this time. This is the correct answer. The infiltrate in the lungs is most likely pulmonary infiltrate with eosinophils (also termed eosinophilic pneumonitis), which is part of the syndrome of heartworm disease. This infiltrate is typically responsive to corticosteroid therapy: anti-inflammatory dosages of prednisone (1 mg/kg PO Q 24 H for 7–14 days). Cage rest with oxygen supplementation may benefit this patient but would likely be unnecessary after 24 to 48 hours. Confusion results because a coughing dog with a murmur and pulmonary infiltrate most often has left-sided heart failure due to dilated cardiomyopathy or mitral insufficiency. Treatment with furosemide, often administered with enalapril and pimobendan (“triple therapy”), typically clears pulmonary edema. 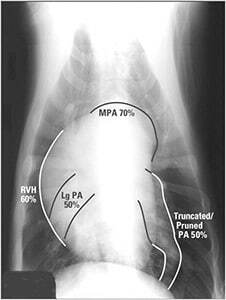 It is important to realize, however, that cardiogenic pulmonary edema results from left-sided heart failure, which is often caused by mitral regurgitation in veterinary patients. Heartworm disease, on the other hand, affects the right heart. 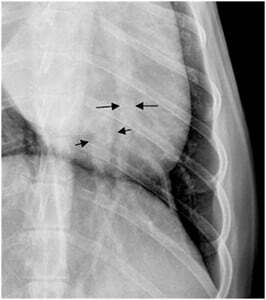 In a veterinary patient, the long-term presence of heartworms and their secretions produces pulmonary hypertension. Pulmonary hypertension affects the right heart by increasing afterload, overworking this volume pump. This stress leads to ascites, hydrothorax (on occasion) and, uncommonly, pericardial effusion. While this dog had a murmur, it was over the tricuspid valve (probably due to tricuspid insufficiency produced by pulmonary hypertension) and not likely associated with left-sided heart failure. In addition, the dog’s relatively slow heart rate argues against heart failure. Pulmonary veins larger than the corresponding pulmonary artery indicate impending or florid heart failure; with heartworm disease, the opposite is true (artery larger than veins). Atrial/ventricular enlargement is right-sided with heartworm disease (with or without heart failure) and left-sided with left-sided heart disease, such as mitral regurgitation (with or without heart failure). See the Figures for radiographic examples of various cardiac conditions. Figure 2. This radiograph from a dog with heartworm disease shows an enlarged main pulmonary artery and enlarged, truncated caudal pulmonary arteries, compatible with the pulmonary hypertension seen with heartworm disease (A); the structures discussed in A are outlined and approximate percentages of main pulmonary artery (MPA) enlargement, pulmonary artery (PA) pruning, PA enlargement (lung), and right ventricular hypertrophy (RVH) seen in dogs presenting for heartworm disease are included (B). Figure 3. 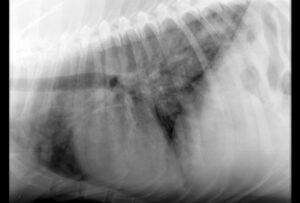 The radiograph (A) shows an enlarged left caudal pulmonary vein in a dog with resolving left heart failure, secondary to mitral valvular disease; lateral to this finding is the lobar bronchus and pulmonary artery. The second figure (B) is labeled with arrows to show the vascular structures (long arrows = pulmonary artery; short arrows = pulmonary vein); the distended pulmonary vein indicates elevated left arterial pressure and florid, pending or resolving left heart failure. Appropriate treatment for the dog described includes an anti-inflammatory dosage of corticosteroids, cage rest, and oxygen. Lung lesions typically clear and signs subside. Once signs have subsided, adulticidal therapy (split or 3-dose regimen) can be considered. See the July/August 2012 Heartworm Hotline column—Doxycycline in the Management of Heartworm Disease—for a discussion of adulticidal therapy and doxycycline’s role in treatment (available at todaysveterinarypractice.com). Exercise restriction is imperative after adulticidal therapy because physical activity is associated with acute lung damage. This is an important consideration because the lungs are typically compromised by products released from dead and dying worms, which often produce thromboembolism—a syndrome of dyspnea, cough, and collapse. The prognosis for this dog, even though it is quite ill at the moment, is generally favorable. Figure 2 reprinted from Ettinger SJ, Feldman EC (eds): Textbook of Veterinary Internal Medicine, 6th and 7th ed. Philadelphia: Elsevier Saunders, 2005 and 2010, with permission.